I've been mulling over my friend, Terry Starbucker's, list of ten surefire ways to impress your boss. Wow! What a great list. One of the items on his list jumped off the page this morning: Display common courtesy, especially by returning phone calls and emails. Why did that one stand out? Glad you asked. 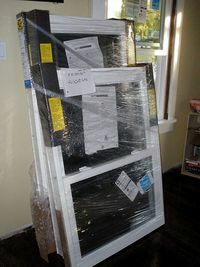 My wife and I made a large investment to replace many of the windows in our house with some great Pella windows. We made the arrangements early in the summer and the windows were delivered in July. The contractor who is doing the work told us to order them and get them delivered, then he would work us into the schedule. The original projection was August. That was eventually moved to September, then "mid-September." We are past mid-September and I haven't heard a word. This week I've left more than one message asking for an update. No response. I'm assuming, by the lack of response, that the news is not good and the contractor has to push out the installation. In an effort to avoid the conflict, the messages are going unreturned. The problem is, the lack of response keeps us in the dark. Having no idea when the project will start is worse than being disappointed in the answer. The frustration of trying to get an answer is added to the disappointment of the schedule change. "Oh, honey. Are you alright? I knew when you didn't call me back that something must be wrong. That's one of the things I appreciate about you. You're the only vendor who I can count on to immediately call me back. Even when you know I'm not going to like the news, you still call me. You have no idea how much I appreciate that." Avoiding your customers because you've got bad news is only going to delay the moment of truth, increase your customer's frustration, and ensure an even worse conversation when you finally do call. Your customer may be dissatisfied with the news you have to deliver, but quick, honest communication minimizes the damage. Customer satisfaction is built on a foundation of honest communication: good news and bad. So right. It is quite key to keep the customer informed. I phoned one of the Co-Op Bank helplines who played the following message. There was no option to leave a message, or no indication of when they could take my call. It was in articular the disconnect that I felt to be very rude. I tried calling back a couple of times that same day, but still got no answer. I then called another line at the Co-Op bank and the agent promised to call me back today. It’s the end of day and still no call back. As well as honest communication, customer satisfaction is also about doing what you sy you will. Wow! What a great example of deplorable service. You hit the nail on the proverbial head, Jonty. Make sure you service delivery matches your marketing promises. Amen, brother! But I would have gone elsewhere to get thos ewindows installed after the 2nd non-returned call. You are more patient with poor service than I am.